Twenty minutes into Kim Longinotto's latest film, Dreamcatcher, which will have its world premiere at the 2015 Sundance Film Festival, a chilling scene takes place. The setting is an after-school club at a Chicago high school, where at-risk teenage girls are being counseled on how to say “No” to boys. As the teenagers munch through copious amounts of junk food, a girl confesses that she was raped at the age of 11 at a friend's house. Another girl interrupts to tell a story of long-term abuse by a family friend, then another story of abuse follows, each more harrowing than the one before it. It's astonishing to hear the details of these unreported crimes, and as they quickly pile up, to realize how endemic it is to these girls' worlds. It's the sort of scene that stays with you for a very long time. For anyone familiar with London-based Longinotto's extraordinary body of work, however, such moments are to be expected. Her subjects often take advantage of the presence of the camera to make their marginalized voices heard. While she is considered an "observational" filmmaker, and avoids interfering in the action while filming, she is well aware that by being there, she very much changes what is taking place. "It's something that has happened a lot with making films," she says. "People grab the opportunity to have a witness. It's not ‘fly-on-the-wall’— a term I hate. You're going in as someone who is going to make something with them. They feel part of it." Having seen most of Longinotto's films, I point out to the filmmaker that my strongest memory of such a moment was the 8-year-old girl Fouzia in The Day I Will Never Forget (2002), who uses the camera to recite the titular poem, protesting the practice of female genital mutilation. "Yes, The Day I Will Never Forget poem is exactly like that scene; they grab their chance," Longinotto exclaims. "Students at film school often say, 'Being a documentary maker, I feel bad that we're going in and we're taking advantage of people.' And I always say, 'Well, why do you think that? Is it because you've been watching reality TV? That's not the only way of doing it.' If you are using that analogy, Fouzia completely used me: She told me where to stand, she bullied me into going into her house, and she wanted me there because she knew her mum would listen. So she used me, but I loved being used. We used each other. You wouldn't even use the word 'use.' We were working together." Indeed, when Longinotto first met the Chicago teenagers, she encouraged them to take control. "I said to them, 'Look, this is your film and I really want you to feel good about the film and be part of it. And you will have the film when it's finished. And we're doing it together; I'm relying on you. I'm not going to interview any of you. This is your film, so you do whatever you want.'" Longinotto also showed the girls excerpts from two of her films that feature strong women working to fight abuse: Rough Aunties (2008) and Sisters-in-Law (2005). "They all went very quiet and went off and didn't say anything, but we all had a bit of a hug because it was quite emotional," says Longinotto. When it came to filming the girls in the after-school club, Longinotto felt that they had built up a trust that allowed for intimacy: "I knew in that scene, I could go really close and film them. I was half a meter away from them; you can see how closely it was filmed. And there was this real level of trust." The in-class confessions came as a surprise to the girls' mentor, Brenda, who had been running the group for two years and was trying to prevent the girls from being abused, not fully realizing the extent to which they already had been. Brenda is the “dreamcatcher” of the title—a mesmerizing woman who has overcome a horrific life on the streets to devote herself to encouraging girls to do the same. Articulate, impassioned, non-judgemental and utterly focused, Brenda exuded a strength in character that convinced producer Lisa Stevens that hers was a story well worth telling. 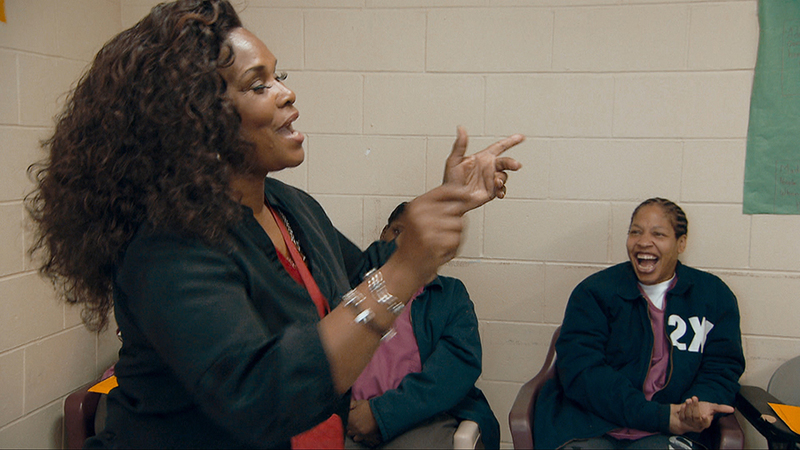 Stevens met Brenda through her coworker Stephanie, when producing the feature-length doc Crackhouse USA (2010); Stephanie's son is currently serving 42 years in prison. Recognizing the strength of both the characters and the story, Stevens nurtured the relationship for several years, ultimately bringing the idea to Teddy Leifer of Rise Films, with whom Longinotto made Rough Aunties. A trailer that Stevens shot of Brenda was integral to convincing Longinotto to come aboard the project. "If I'm being totally honest about it, I thought, 'A film about prostitutes? Do I really want to do this?'" the filmmaker recalls. "I find films dispiriting, if there's nothing to hope for or fight for. But when I saw the trailer, and saw her feisty and full of energy and joy—Brenda and Stephanie both are—and that they are actually doing things, they are changing lives, I thought, 'I really want to do this.'" Longinotto, Stevens and a sound recordist traveled to Chicago for a ten-week shoot. Dreamcatcher was a far cry from the other US-focused film Longinotto had directed—Rock Wives (1996), which looked at the privileged lives of wives and girlfriends of rock stars. Indeed, she found Chicago to have much in common with Durban, South Africa, the location for Rough Aunties: "The neighborhoods where we were living, the largely white neighborhoods, everything worked, the pavements were nice, the roads were nice, there was lighting," she recalls. "And then you'd go into the black neighborhoods and a lot of the houses were boarded up. There were actually plants growing out of the middle of the road...It's surprising because America is the richest country in the world, supposedly. And Chicago is where Obama lives. It takes your breath away." Dreamcatcher was edited by Ollie Huddleston, with whom Longinotto has made eight films. When I visited them halfway through the ten-week edit, it was clear, as Longinotto is quick to point out, that they are equal partners in the post-production process. They were working their way through a second viewing of the rushes—an impressively restrained 30 hours. "That's what's fantastic for me, because she really shoots very little," Huddleston says. "And she knows why she shot it and she shot it with a beginning, middle and end-ish in mind—or some idea that you need one." Longinotto frequently sits back while Huddleston brings his considerable story-making skills to each sequence, their discussion focused on what each scene contributes to the story. They often finish each other's thoughts, in a shorthand that speaks to the many months they have passed together in close proximity. "I think editing is the bomb. It's the most important thing," says Longinotto. "I can't imagine doing it with anyone else." Dreamcatcher follows Brenda in her day job, counseling incarcerated prostitutes, and at night on the streets, as she speaks to women in a roving van, an all-night cafe, or anywhere that can provide a brief respite from the ever watchful pimps. Brenda's ever-changing array of wigs are testimony to the many facets of her character, as she shifts between champion, motivational speaker, sympathetic ear and confessor. There is nothing that her girls can tell her that she hasn't seen before, or witnessed herself firsthand, nor seemingly any subject that is off limits. The film is full of revelations. Like many of Longinotto's films, Dreamcatcher is a story where many men do not come out well; the Chicago of the film is a world of baby daddies and violent pimps. Homer, the film's major male character, is a reformed pimp who now works with Brenda as a public speaker, but, rather creepily, says he has few regrets about his past. Dreamcatcher is an important contribution to Longinotto's life work documenting the attempts of girls and women to recast themselves in a world dominated by men. It's a compelling, harrowing and utterly uplifting story of redemption that should have a long life as a resource for those working to help those with lives mired in prostitution and substance abuse. Longinotto's hope is that the film, above all, will bring awareness to the inherent hopelessness of criminalizing prostitutes. "I want the film to decriminalize the women—that's what I want," she maintains. "And help them when they're in jail. I don't feel comfortable with using a film to criminalize anyone. I think films have to be seen in a wider way. It's about changing a mindset and opening windows and getting people to think more humanely and differently." Dreamcatcher premieres March 27 on Showtime. Carol Nahra (@CarolNahra) is an American, London-based freelance journalist and documentary producer, who also works as a consultant for Sheffield Doc/Fest and teaches documentary film and digital media courses for Syracuse University's London program. She's also a longtime contributor to Documentary magazine/documentary.org. Subscribe to her new blog at docsonscreens.com.